Iconic Marine Group is focusing on outboard-powered boats over 30 feet in its Fountain, Donzi and Baja brands. Shown is the 38-foot Fountain center console, which was new for model year 2017. Iconic Marine Group, which purchased the Fountain, Donzi, Baja and Pro-Line boat brands last year, is bringing Fountain founder Reggie Fountain back on board and is set to release several new models at upcoming boat shows. “There’s some very familiar names over the last 100 years that have changed the business, and Reggie’s one of them, especially when it comes to performance,” Iconic Marine Group COO Joe Curran told Trade Only Today. Iconic Marine Group was formed in May of 2016, when it quietly purchased the brands, making the announcement in August. The brands had changed hands, sometimes contentiously and out of bankruptcy, several times in the decade preceding the purchase. One of the partners in the Iconic Marine Group bought out the shares of Pro-Line in December. Last September the company began focusing on the Fountain brand and its saltwater fishing boats. “We got our production levels up starting in January … on the 38 and 34 Fountains,” Curran said. “We’re really focused on the saltwater market. The saltwater fish boat market is growing, as you know, particularly from 32 to 42 feet. We’ve put together a design team internally and have had a full-blown design and engineering team” since January. “You’re hearing me go to bigger boats, 30 feet and up, and that’s going to be our focus for the next few years” across the brands, Curran said. The company plans to introduce a new 39 Fountain as early as the Fort Lauderdale International Boat Show, which will be completely new from top to bottom, Curran said. It is also adding two 42-footers to the schedule — one geared more toward offshore fishing and the other slated to be a little more geared to the recreational side, Curran said. 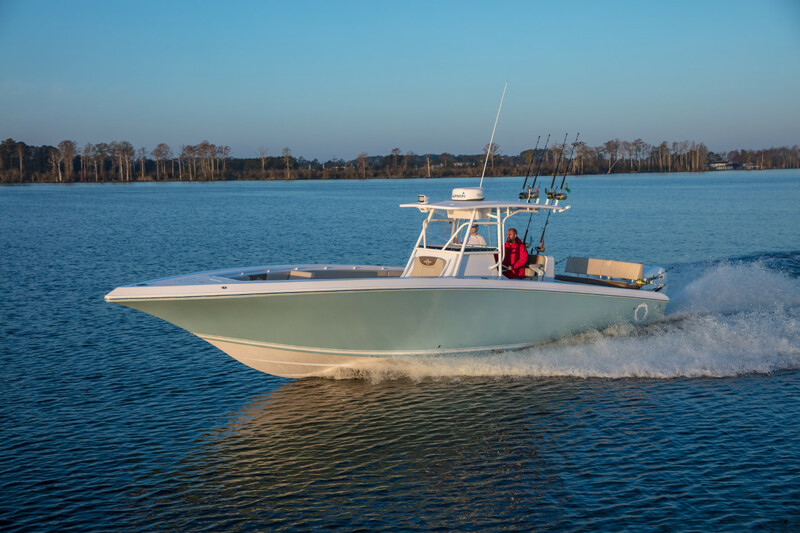 The company has gained 15 dealers in key markets during the past year, Curran said, and has refitted the whole plant in Washington, N.C., to build larger boats. “When you look at our plant capabilities and skill levels of our people, I think it’s dramatically changed in the last six to eight months and we’ve definitely got our processes in line at this point. We’ve been busy this year,” Curran said. The Donzi brand will introduce a 38-foot recreational sportboat at the Miami International Boat Show in February, focusing on outboard propulsion rather than sterndrive, Curran said. It will follow that up with a 36-foot model. Baja has been building 23-foot and 26-foot Outlaws, and is starting production on a 35-foot Outlaw as well, Curran said.